Tonelab SE, Guitar Amp Simulation Pedal from Vox in the Tonelab series. 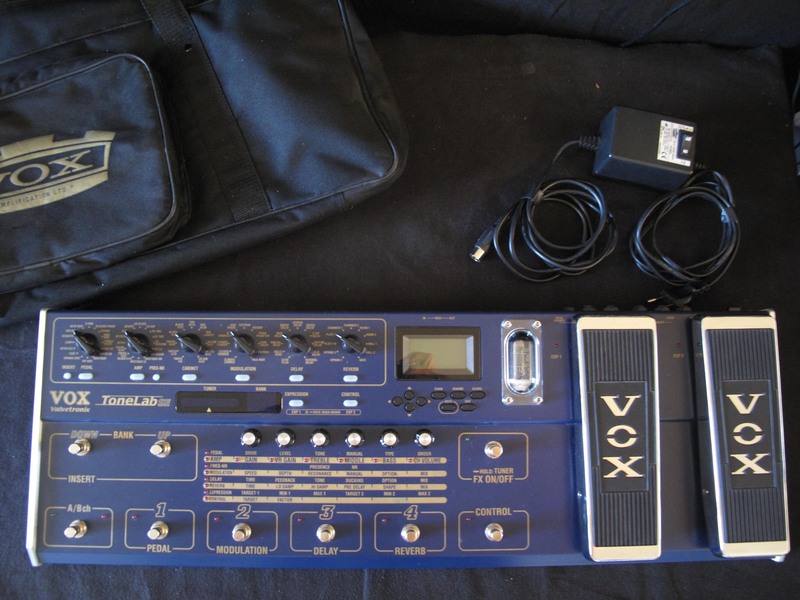 MGR/Will Foster's review"Vox Tonelab SE Floor Board Multi Effects"
Been playing guitar most of my life (i'm 41 now). Tastes range form Rock, blues, Christian worhsip. Purchased from Sound Control in Birmingham around the same time I was upgrading all my gear - it was used with my Mesa Boogie F50 and Gibson Les Paul or Fender Stratocaster. I think it cost £399 - they had only just come out at the time - you can get them much cheaper now. I was attracted by having all effects in one unit, it looked great with two expression pedals and the valve showing and the flexibility and number of effects was just out of this world. I've sold it on ebay now. I'm a bit of a techno-junkie (and computer programmer), but never really had the time to work out how programme it properly - it was just a little too complex for what i wanted for a live gig - even though I had pre-programmed the channels beforehand (although for recording when I had more time to dial in the efects and play with it a bit more it was great). I never seemed to be able to get the best sounds on the unit and had problems in getting 'equal' volumes / levels when switching between pre-sets, especially when changing between clean and crunched sounds. When it was used in bi-pass mode it seemed to loose gain / brightness (even with the gain switch at the back set on max) and again, problems getting even levels between bi-pass and effects. Fantastic - at a gig I accidentally dropped my Gibson on it - took a chunk out of the headstock of the guitar, only made a minor dink on the case - rock solid construction. If you have the time, patience and ability, then this unit is well worth having - I take full responsibility for not generating the time to get the best out of the unit, but hey, i just decided I wanted something simpler. Started playing piano and trumpet at age 5, and still playing everything i can get my hands on!! I perform with guitar and bass for the most part these days. Even with their set programs this thing has fluctuations in tone and volume. I swapped cords,guitars,tried it thru my Mesa Maverick, Ampeg V-4 (yes i bought it new...i'm that old!!) and through a Marshall JCM 800...same result. Went back to Guitar center and their display does the same thing. 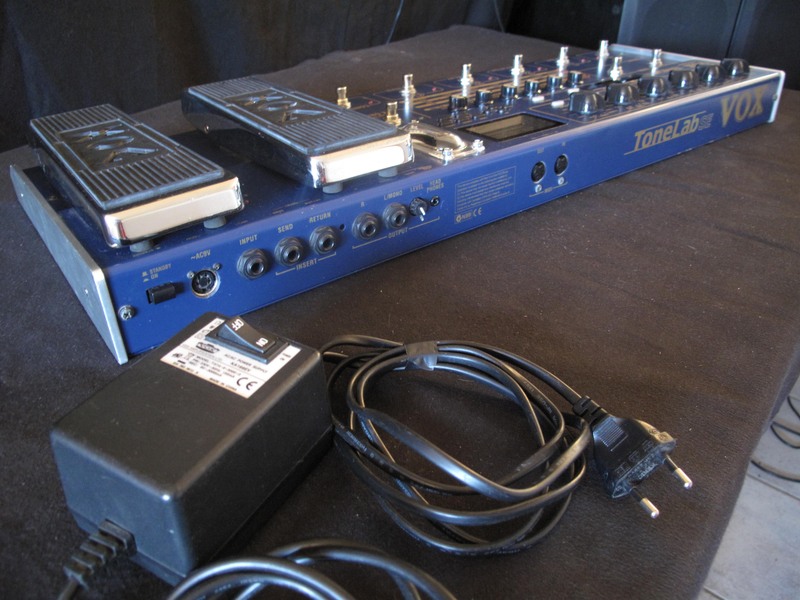 I returned it on the spot and I will continue to use the assortment of stomp boxes and Wah pedals I own. I didn't keep it long enough to have an opinion on that! As far as the effects....No one company makes the best of each type of effect. Find ones that sound good with the rig you play on. As far as the amp modeling pedal.....I only play tube amps and the concept of a modeling pedal is quirky at best. If you want a certain sound save up and buy the thing!! Why did I buy it??? Too much time on my hands and too much cash in my pocket...dangerous combination. Good thing Guitar Center has an excelent return policy!! 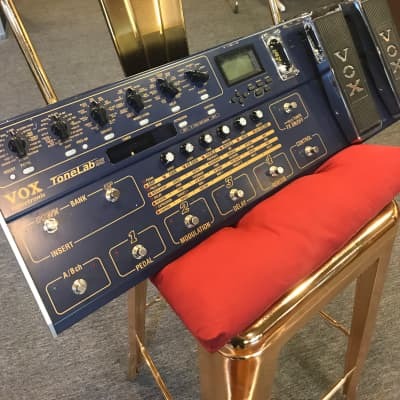 MGR/Scott C's review"VOX Tonelab SE"
Several things I like about the unit. First, it's easy to edit sounds, the pre-amps/cabinets and effect chain is layed out so that it is easy to access and edit, and the unit shows you where the parameters were set before you started editing them. Second each program allows you to save A and B amp selections, thus creating two different sounds with the same array of effects for each program. Also, being able to assign effect parameters to the expression pedals is a nice feature. Overall the sound quality is good, you can create some warm/natural sounds without sounding over processed. I've spent alot of time trying to get a great sound out of my guitars and amps, and I often play directly to the amp, without coloring the sound. You can't by-pass this unit. Well, you can by-pass the effects, but I can't find a way to by-pass the pre-amp and cabinet simulators. You should be able to do this without buying an A/B switch. The other complaint I have is the tonal characteristics. The tone controls for the pre-amps seem weak to me, the cabinet selection is where I needed to go to develop the tone, also, the unit sounds a little dry, there's not much headroom, not like you'd have in a tube amp. (I know this has a tube, but it's basically a solid state processor). So depending on what you're looking for, it may or may not fit the bill. The construction of the unit is excellent. It's easy to use and built to last. The bottom line is, I like the unit, and you get alot of usable features for the price. I'm going to try work with it and decide weather or not to keep it. 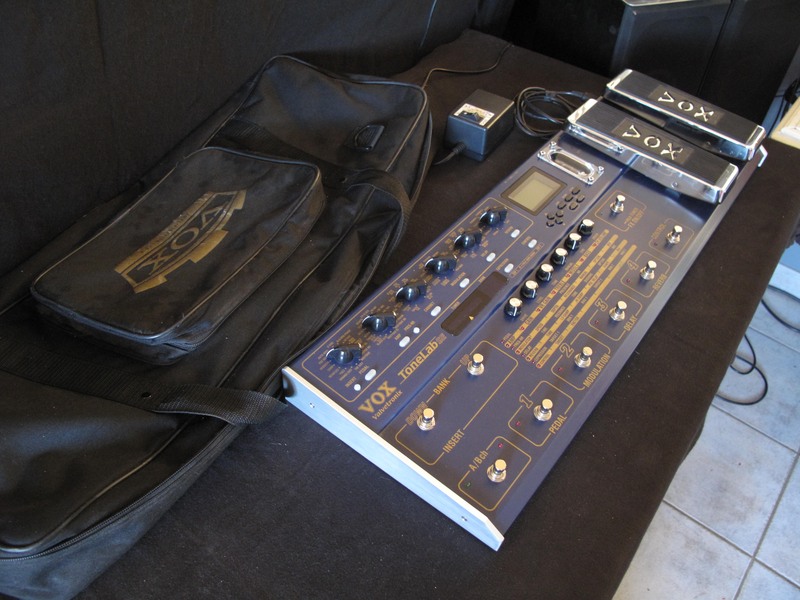 MGR/Guilleonline's review"Vox ToneLab SE Pedal Board"
Hi everyone. I got this unit from guitar center, at a reasonable price. Let me say that i was not really sure about its performance because there was no review written about it, sine it is a brand new item. How ever, for the information that you get from the manufacturer's website, and some other places on the net, I decided to go ahead and take the chance. It was a great decision. first of all, like the GT-6, which is a great unit too, it switches from program to program in real time, like if you were using single pedals. 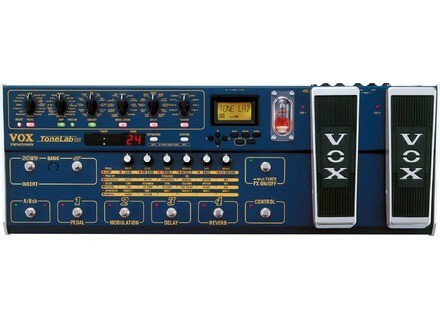 The effects are very clear, and the variety of modulations, amps, cabinets, etc is just all you need and even more. About how easy it is to use it, all I can say is that it is perfect for someone whoi already has experience in dealing with pedal boards. If you are an amateur on this, then this unit might be kind of complicated for you. However, keep in mind that This ToneLab SE was designed for guitarists who know what they are doing. And on top of all that, I'll conclude saying that it is the only pedal board ever made that works with pure tube warmth. Match it with a hot rod fender amp, and you'll have the greatest sound of all. It is heavy, because it is huge, and its all steel. I think it will last forever. Awesome unit. If you can afford one, consider buying it. Only if you are a serious player though. You'll love all the features and capabilities it has. no gap when switching between programs. did i mention it is tube driven?!?!?! grab one if you can! they are currently very few on the market.